Why should guitarists have all the fun? This is a no-brainer onstage pedal for vocalists. Selection of voice-changing effects. Harmonies with dedicated footswitch. Onboard looper. The VE-20 is a very practical and easy-to-use product. The VE-20's presets offer a varied cross-section of the unit's capabilities. We've already taken a look at the various models in the DigiTech Vocalist range that can automatically generate vocal harmonies dependent on an input signal from your guitar. 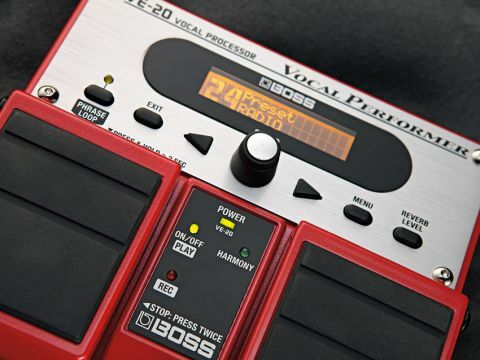 Now up for review is the BOSS VE-20, a vocal processor that doesn't rely on a guitar signal. "The VE-20 is a lot of fun, sounds pretty good and will be easy to use onstage." The VE-20 takes the familiar BOSS twin-pedal form as seen in the RE-20 Space Echo and the RC-20XL Loop Station. It's a very practical and easy to use processor - you just plug in a mic, dial up one of 30 presets and start singing. That said, there are a variety of editing tools under the hood if you want to get stuck in and create your own sounds for storage in the 50 user memory locations. An additional feature is a phrase looper with 38 seconds (mono) of recording time. Each of the preset and user patches is created from a chain of up to six effects (dynamics, pitch correct, tone/SFX, double/harmony, delay and reverb), each with its own editable parameters. Knobbage is quite minimal on the VE-20, with just a central knob to scroll through and select the patches. Reverb level is the only parameter that can be accessed by a dedicated front panel button but there are four more buttons, including two cursors, for getting into the menus and editing. The left footswitch is the on/off switch for the overall sound, while the right footswitch is set by default to turn the harmonies on and off, although you can opt to set it to switch other effects within a patch if so desired. The VE-20's factory presets are a varied cross-section of what the unit can do and are based on various musical styles, special effects and different harmony intervals. While you might find something here that you can use straight out of the box, you'll probably head for the user patches where you can store your own particular sounds. To this end, editing is dead easy, with perhaps the two most crucial parameters instantly available - one being the previously mentioned reverb level and the other being the key for the harmonies, which is accessed by a single press of the right cursor - the rotary knob choosing a key other than the default C major setting. All edits are automatically saved. Other parameters are easily accessed from the menu, including setting the level, pitch interval, pan and gender of the two available harmonies - unison and up or down thirds, fourths, fifths, sixths and octaves are all available. Doubling is also available as a harmony choice. While the harmonies are an important part of the VE-20, BOSS has also put in plenty of vocal effects should you want to sound like a robot, Cher, or even a tinny radio. The pitch correction FX block has an 'electric' setting for that abused Auto-Tune sound, while the available tone/SFX types include chorus, flanger, strobe (a tremolo effect), radio, preamp (for EQ and the like) and distortion, which possibly combined with an octave down harmony should tickle the fancy of death metal vocalists. The VE-20 is a lot of fun, sounds pretty good and will be easy to use onstage once you've set up all your patches, if you don't mind bending down and selecting them between songs. This pedal offer creative possibilities for vocalists and may be particularly suited to solo acts that want to add a little interest to their music or just present a bigger sound to their audience.